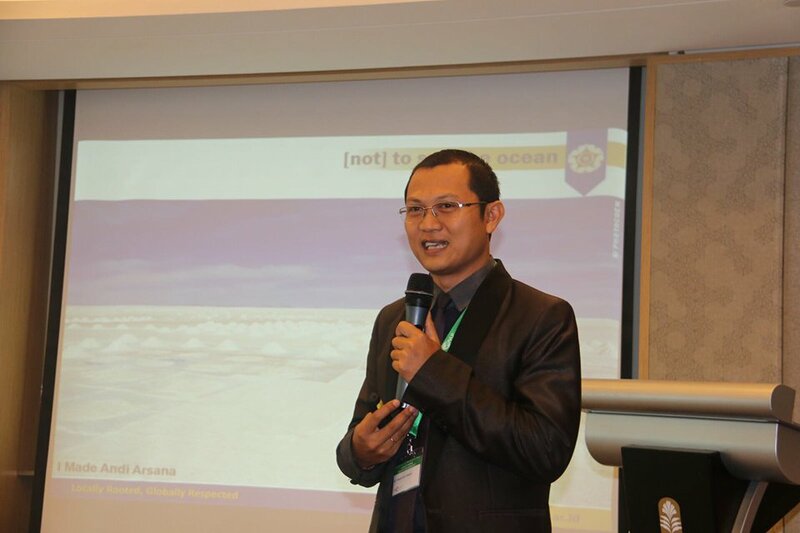 Andi is a lecturer and researcher at the Department of Geodetic Engineering of Universitas Gadjah Mada in Indonesia. He is also the Head of the Office of International Affairs of the same university. 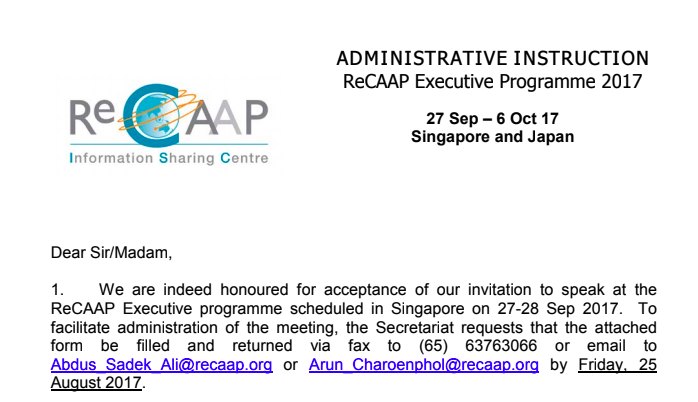 I was invited by ReCAAP (Singapore) to give a lecture on “United Nations Convention on the Law of the Sea (UNCLOS) in connection with piracy and sea robbery” on 27 Sep 2017 (Wednesday) afternoon in Singapore. This was the second time after my first one in Cambodia. It was fun. Another great opportunity to network with important people in the field of maritime security in the region. I really hope that this can be a regular program where I can contribute my knowledge and also learn from different people. UGM mewajibkan mahasiswa S1 dan D4 untuk mengikuti Kuliah Kerja Nyata (KKN) dan cukup banyak dari mereka yang memilih untuk ber-KKN di pelosok negeri, jauh dari Kampus UGM di Yogyakarta. Tahun ini saya mendapat kepercayaan mendampingi sekelompok mahasiswa untuk ber-KKN di Desa Dalum, Kecamatan Salibabu, Kabupaten Talaud, Sulawesi Utara. Secara singkat, kami biasa menyebutnya KKN Talaud. 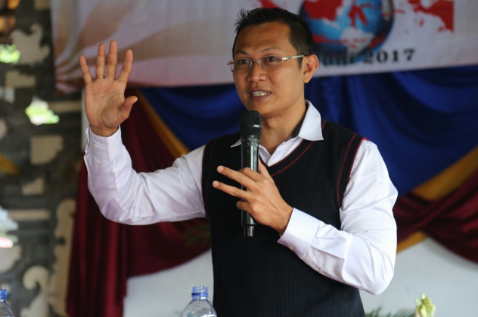 Talaud adalah kabupaten paling utara di Indonesia dan sangat banyak orang Indonesia yang bahkan tidak mengetahuinya sama sekali. Setiap kali saya bercerita tentang Talaud, saya harus mengutip lagu iklan Indomie “dari Sabang sampai Merauke, dari Timor sampai ke Talaud”. Menariknya, tidak sedikit yang kemudian heran dan baru sadar bahwa ada kata Talaud dalam lagu itu. Rupanya sangat banyak yang mendengar “dari Sabang sampai Merauke, dari Timor sampai Kota Laut”. Tentu saja maknanya berbeda dan hilang satu titik penting di negeri ini: Talaud, kabupaten paling utara negeri. In an official visit to Nunukan, East Kalimantan, on June 13, 2017, Ambassador Eddy Pratomo, the Special Envoy of the President for the Determination of Indonesia-Malaysia Maritime Boundaries, informed the progress of his assignment. He clearly noted that the two countries are now working hard toward the definition of fence at sea between them and some progress have been made. Pemerintah Indonesia, melalui Kemenko Maritim telah mengeluarkan Peta Negara Kesatuan Republik Indonesia (NKRI) terbaru. Indonesia memang secara berkala mengeluarkan Peta NKRI. Yang istimewa dari Peta NKRI 2017 ini adalah adanya usulan penamaan ruang laut yang tadinya dikenal sebagai bagian dari Laut China Selatan (LCS), menjadi Laut Natuna Utara (LNU). 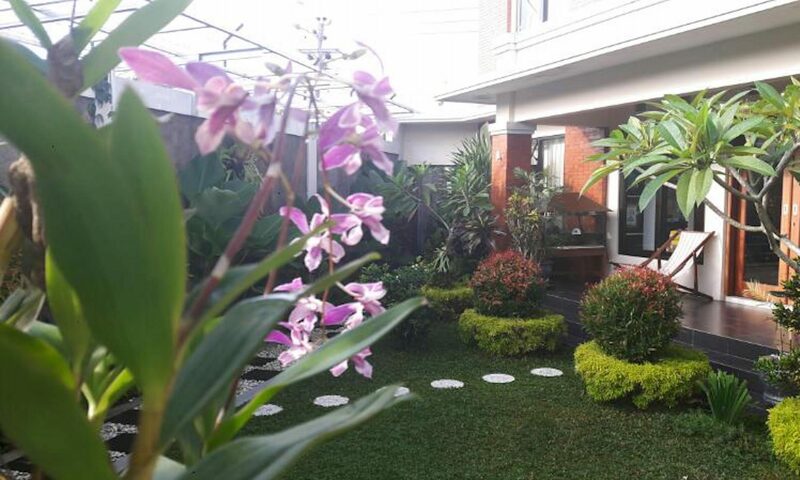 Indonesia rupanya menggunakan kartografi sebagai ilmu dan seni pembuatan peta sebagai alat diplomasi. In the absence of agreed maritime boundaries, States usually have their unilaterally claimed boundary lines. In many cases, these lines represent the most forward possible line such States would want to he the final boundary lines. Thus, such lines are also known as forward positions, which are usually used by coastal States as their initial position in negotiating their maritime boundaries. In the case of Indonesia’s maritime boundaries, for example, these forward positions have been depicted clearly on its official map so they become obvious to its neighbours. In the Sulawesi Sea, where maritime boundaries between Indonesia and Malaysia are pending, both States, using oil concession definition, have proposed their maritime claims defined by their forward positions. Indonesia, on one side, utilises oil concession it defined since the 1960s in defining its forward position. Malaysia, on the other hand, started to define its forward positions and then define oil concessions within those forward positions. The utilisation of oil concession definition to represent maritime claims has also been the case in the South China Sea as demonstrated by, for example, China and Vietnam. 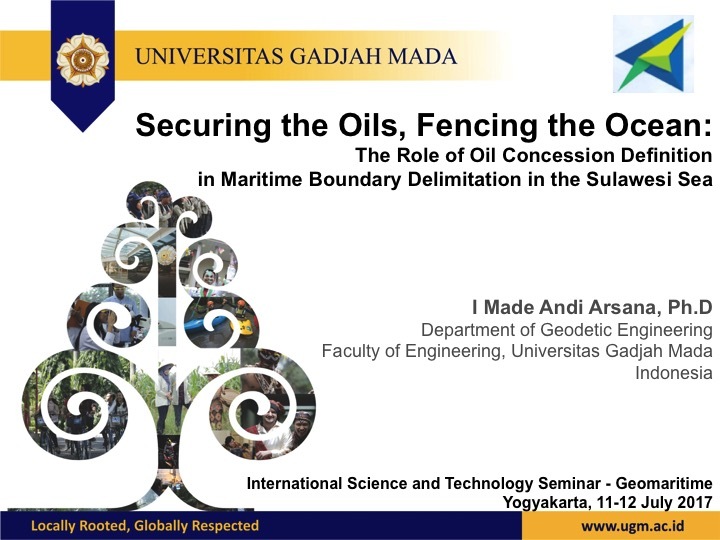 This research presentation analyses the roles of oil concession definitions in defining forward position and how they may affect the delimitation of maritime boundaries between coastal States. The cases in the Sulawesi Sea and the South China Sea are investigated with reference to relevant cases in different parts of the world. Findings and conclusions are then presented. Universities in ASEAN have been collaborating closely to encourage students mobility around ASEAN member countries. 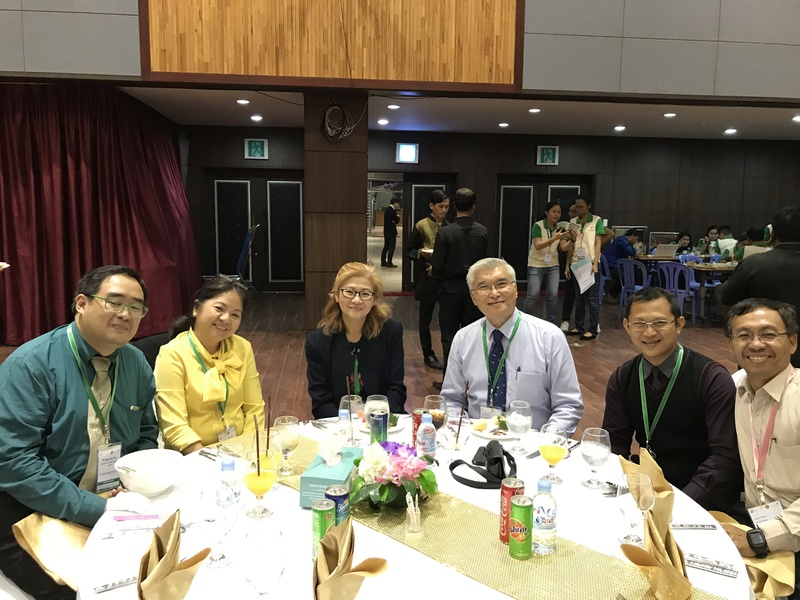 Member of a consortium, ASEAN University Network (AUN), with more than 30 members, are in close collaboration to make the idea a reality. We already have our credit transfer system called ASEAN Credit Transfer System (ACTS), where within the framework, students from ASEAN can study in different universities in ASEAN and the credit of subjects they take will be recognised by their home university. Universitas Gadjah Mada is a party to that system. On 3 to 4 July 2017 I was assigned to represent Universitas Gadjah Mada in my capacity as the Head of the Office of International Affairs in a meeting in Phnom Penh, Cambodia. We discussed the progress and development of ACTS and each university had to present reports illustrating how they have implemented ACTS. 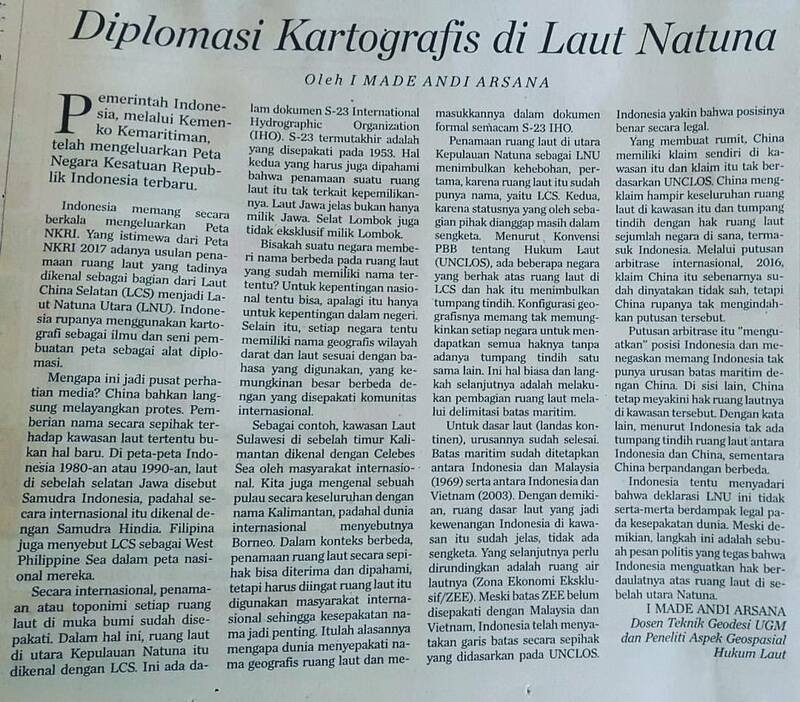 It was interesting to observe that mobility of students in ASEAN needs a lot of improvement. We need more students traveling among ASEAN countries in order of young people to understand each other better. We are now facing ASEAN Economic Community so we need to collaborate. Collaboration without mutual understanding is impossible. I have known a lot of people. I have a number of friends in the government at the national level and even international. However, I had no friends in the Government of Tabanan, a regency where I was born. I thought there must be something wrong. I did not feel right when I realised that I have been invited by a lot of people to share my ideas and expertise but have not received any request from the Government of Tabanan. I had been invisible to them this far. Until one day. Through a friend and relative, I was connected with a member of Tabanan Parliament (House of Representative). A good conversation led to an invitation for me to deliver a speech in Tabanan. After a long wait, I finally am intellectually connected with my home town, Tabanan. On 29 June I gave a presentation to one of the most diverse audience I have ever addressed. Challenging but fun. It turned out that my presentation was well-received. I thanks everybody! Conducting community services or engagement is compulsory for every single student of Universitas Gadjah Mada (UGM) especially those in the undergraduate and Diploma 4 programs. Every year, UGM send around 7,000 students to remote areas all over Indonesia, covering 34 provinces and hundreds of regencies/cities.The students have to live with the community, literally living in their houses and live the life as how they live their everyday life. For most of the students, this can be a life-changing experience. This year, I am assigned as a supervisor of a group of students conducting community services in Talaud, the northernmost regency of Indonesia’s. The island is close to Miangas, one of the most famous islands when it comes to sovereignty issue. From Jogjakarta, Talaud can be reached by three flights in around 15 hours. What a long journey. I was lucky enough to attend the celebration of World Oceans Day (WOD) 2017 at the United Nations Headquarters in New York. For the first time, WOD was celebrated as the main event of the UN General Assembly. The United Nations’ Division for Ocean Affairs and the Law of the Sea (DOALOS) managed to bring the celebration of WOD to the next level. Maritime Affairs and Fisheries Minister Susi Pudjiastuti was also at the event, accompanied by the Indonesian ambassador to the UN.